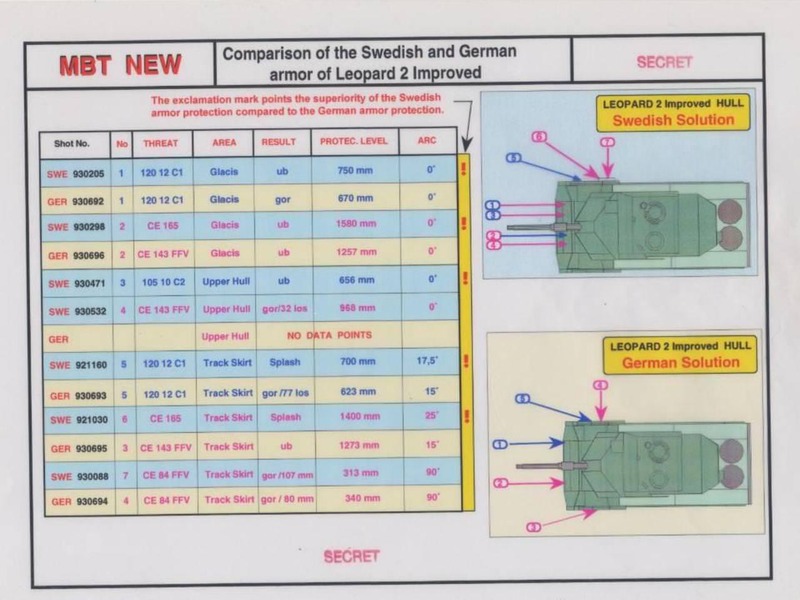 In a previous article, we talked about Sweden evaluating the M1A2, Leopard 2A5, and Leclerc. They settled on the Leopard 2A5, but they weren’t content with the Bundeswehr’s model. They made some specific modifications for their version, the Strv. 122, many of which pertained to the armor. If you think about the armor layout of a modern tank, there are two ways to change it. You can stack additional modules on top of what you already have or you can cut open the armor you already have and mess with it (or do it at build time). The Swedes did both. The applique armor changes are a lot more obvious. The Strv 122 has a significant amount of roof armor added to the turret. 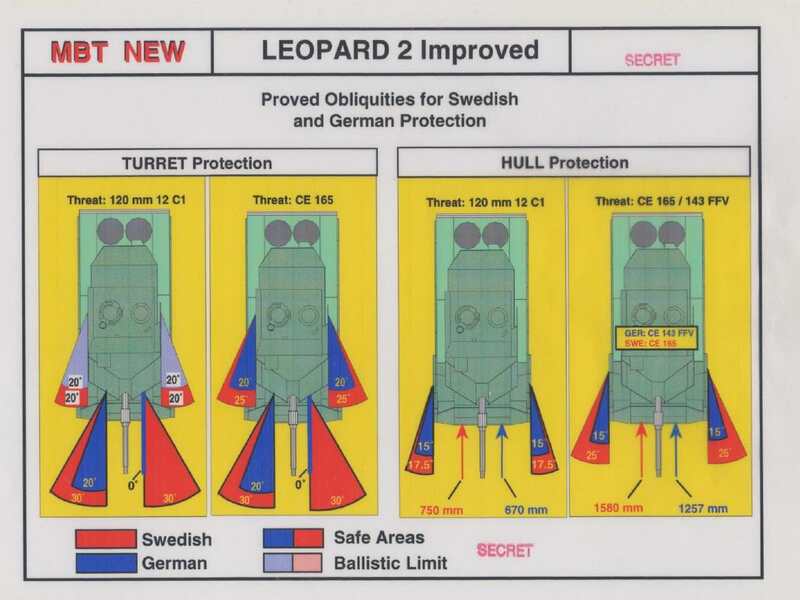 Sweeden also opted for all the latest composite packages within the turret. 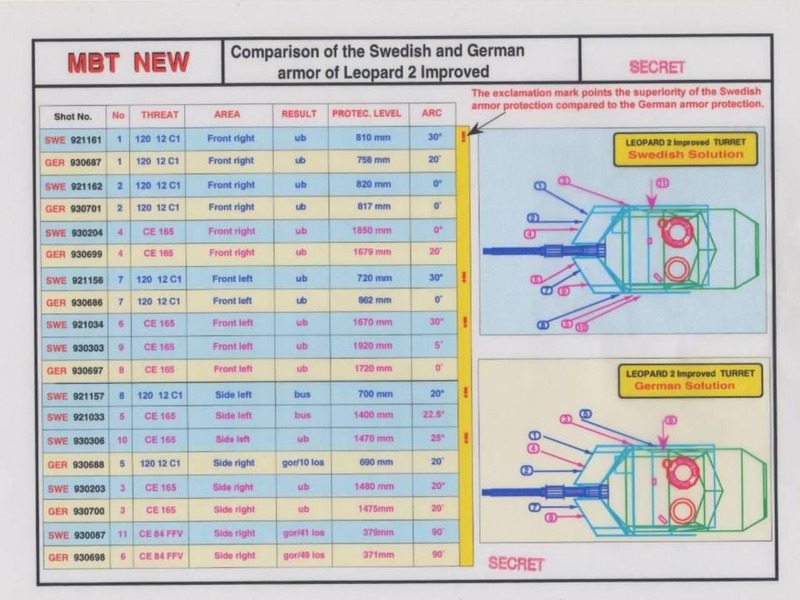 The same document detailing the competition results had these comparisons between a “stock” (at least at the time) Leopard 2A5 and an Strv. 122. Note the above numbers are RHAe levels, not line of sight thicknesses. Also note the use of specific rounds for test purposes. 443 FFV is a Carl Gustav antitank round. I’m not sure what CE 165 or 120mm 12 C1 rounds correspond to. Also, while it doesn’t show up in the charts above, the Swedes opted for a protective housing for the commander’s PERI sight. Electronically, the Swedes opted for the battle management system that the Germans didn’t want to pay for at the time. Starting with vehicle number 84, this was integrated with GPS. The Swedes also opted to mount a tank-infantry phone at the back of the Strv. 122. Sweden also opted to mount the French GALIX multipurpose grenade launching system in place of the standard smoke grenade launchers. While GALIX can fire smoke grenades, it can also fire a wide variety of other grenade systems. GALIX fires 80mm grenades, and can be fired manually or automatically if cued by some kind of threat warning system. GALIX is also used on the Swedish CV90s as well as on the French Leclerc. The Strv. 122 mounts eight GALIX grenade tubes, four per side of the turret. This entry was posted in All and tagged armor, history, militariana on June 5, 2018 by parvusimperator. The only 165 mm chemical energy weapon I can think of from that era is the British L9 short-barreled gun and its massive 64 lb HESH projectile used on British AVRE tanks…. but that can’t possibly be an anti-tank threat that the Swedes were concerned about. Exactly, and I doubt the swedes would use it as a test weapon. I wonder if it’s a model number, not related to size (like 443 FFV for carl gustav)? I’ll take another look at that document.